We bought this bag when we lived near the Mass Ave neighborhood in Indianapolis to shop at local stores with a discount. 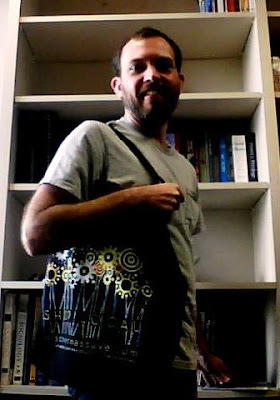 None among those who have commented have specifically said that the bag is feminine, but the comments imply that my use of the bag is not masculine. One of my coworkers noted the stylized flowers as problematic. Others have mentioned the manner in which I wear the bag, over the shoulder instead of hanging by the straps. I'm wondering how much of this is universal and how much is particular to a rural community in the Deep South. UPDATE (4/26/2012 3:15 PM): This reminded me of a classic Friends episode (embedding unfortunately disabled).